Your favorite product: Steel earrings, light blue oval with flowers, puzetové earrings X03.18 - is added to the wish list. 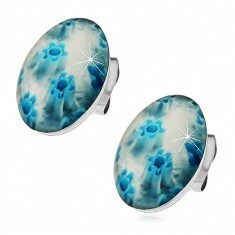 Earrings made of surgical steel oval shape, decorated with blue flowers and covered with a transparent spherical glaze. Your favorite product: Puzetové made of steel with multi-colored dots R23.8 - is added to the wish list. Earrings made of steel - colored circles on a light blue background. 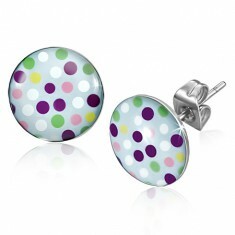 Your favorite product: Earrings made of surgical steel, multicolored dots S25.27 - is added to the wish list. Circular steel earrings, colored balls on a light blue surface, glaze, puzety. Your favorite product: Light blue fake ear plug made of steel, star in circle PC09.02 - is added to the wish list. A steel fake ear plug, a glossy light blue finish, rubber band black color. Your favorite product: Piercing in the chin of steel, turquoise blob on yellow background W30.11 - is added to the wish list. A steel piercing, labret, round tip with the blue-yellow image patches, glaze. Your favorite product: Oval hinged earrings made of steel in black color, light blue rhinestones S76.07 - is added to the wish list. 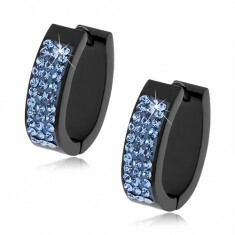 Glossy and smooth steel earrings, black color, elongated oval shape, with a triple line of light blue zircons. 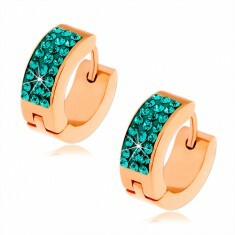 Your favorite product: Articulated steel earrings gold color, three lines of turquoise zircons S75.02 - is added to the wish list. Shiny earrings made of surgical steel, gold color, triple belt inlaid with sparkling turquoise rhinestones. Your favorite product: Steel piercing into the belly of a silver colour, turquoise glitters PC02.27 - is added to the wish list. Shiny piercing in belly button of steel, silver in color, shimmering bead adorned with turquoise glitters. 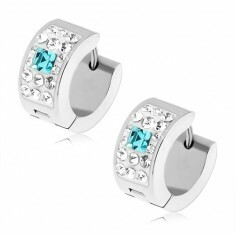 Your favorite product: Steel earrings, silver color, clear rhinestones, light blue zirkonový square S84.01 - is added to the wish list. Articulated earrings in steel silver color, white stripe with čirými cubic zirconia, light blue square stone in the middle. 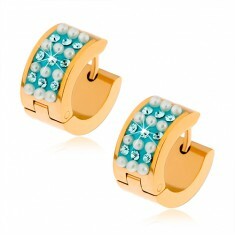 Your favorite product: Steel earrings gold color, white beads and turquoise cubic zirconia S86.05 - is added to the wish list. Shiny earrings made of steel, gold color, turquoise stripe, a line of turquoise stones and white beads resembling small pearls. 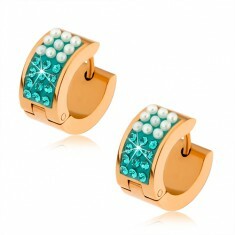 Your favorite product: Steel earrings gold color, pearly white beads, turquoise, cubic zirconia S86.16 - is added to the wish list. Earrings made of steel 316L, gold color, turquoise stripe with white beads, resembling pearls, turquoise rhinestones. 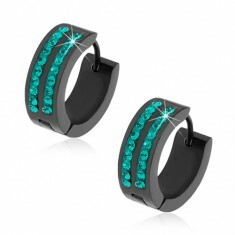 Your favorite product: Black circular stud earrings made of steel, the two strips of turquoise zircons S85.16 - is added to the wish list. Earrings made of surgical steel in black color, decorated with two stripes of turquoise zircons. Your favorite product: Circular stud earrings made of steel of light blue color, the articulated fastening S79.11 - is added to the wish list. 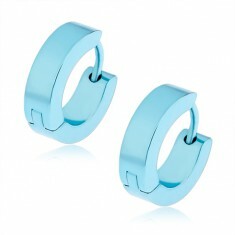 Steel earrings, light blue color, smooth and mirror gloss surface, a circular shape. Your favorite product: Steel earrings, silver color, light blue round zircon, puzetky, 7 mm SP91.18 - is added to the wish list. Earrings made of surgical steel, silver color design, light blue brushed zircon round shape, puzetové fastening.